First, thanks to all the authors of The Grotesquerie who participated in my interviews! I’m pleased and proud to not only be able to showcase so many different insights on my blog, but to stand with you guys in the same book. I thought I’d wrap this up with the woman whose evil genius plan it was to bring The Grotesquerie to fruition. That’s right, today it’s my pleasure to interview author/Grotesquerie editor, Eden Royce! SJ: Why horror? Out of all the things to write, why does this genre appeal to you? ER: While I read and write in several genres, I always come back to horror. There’s something so visceral, so basic about it. Not everyone loves romance. Not everyone is thrilled by adventure. Everyone has fears. Reading and writing horror is a way to expose yourself to those basic instincts we all have, in a way that’s controllable. I mean, if it starts to be too much, you can put the book down or hide the DVD in the freezer. SJ: Who or what were your horror genre inspirations growing up? What made you realize that you wanted to explore and participate in the genre? ER: I love gothic horror. Isolated houses on cliff tops, mad scientists, hidden rooms, and family secrets. I enjoyed the black and white movies from the 30s with Bela Lugosi and Boris Karloff, as well as the Hitchcock classics. Sci-fi horror is also a favorite of mine. John Carpenter’s The Thing and Alien come to mind. When I found myself thinking, “You know what should have happened?” I knew I wanted to write my own vision of horror with my sensibilities. SJ: What are women’s roles as horror characters? Are we doomed to be portrayed as victims or numbers on the sexual Richter scale? Is it possible for male readers to find female horror characters that resonate with them? As horror progresses, it’s evolving and shaking off some of the tropes of the genre. More women are surviving horror movies. There are more Black “final girls” in movies. Publishing is releasing more stories in which women are strong, smart, and involved in the storyline; they’re not just naked and dying early in the work to fuel a male character’s vengeance. Male readers can find female characters to resonate with them, but these female characters must be ones of substance. They need to be multi-layered, able to keep up with their male counterparts, have brains and grit. SJ: Why do people need to know about women horror writers, film makers, etc. What makes us equal or special in this already-saturated genre? ER: People need to know there are female horror fans out there. I think that’s sometimes overlooked. Inevitably, when a group of people is interested in something—a sport, a type of game, whatever—they want to put their fingerprint on it. The same with horror. Women love the tension of horror, the unexpected, and the unsettling creep it brings. Many women have had a fascination with horror for years, but there are times when we’ve watched a movie and thought: No woman would ever really do that. Women right now are underrepresented in the horror genre. That makes us hungry to show what we can do and that’s instill fear with the best of them. SJ:Who are some women horror writers/film makers/etc that people definitely should know about? SJ: Where do we go from here? Is it a matter of authors reaching out to local stores and libraries during February to encourage displays or readings by women horror writers? Is this an issue that should be taken to publishers to make sure there is equal representation of female-written horror in their catalogues? Is it a marketing issue, something that just gets lost in a jam-packed market? Is it a matter of readers just not knowing or caring, of sticking with what they know? We can’t be concerned about those posts. We as females in horror: writers, readers, film-markers, artists, need to encourage each other, share our work, and put out the best, the scariest, the most core-shaking product we can. Then the world can’t help but listen. Twenty-two short horror stories written by women are here on display for your enjoyment or your perverse fascination. Within these pages, beauty becomes deadly, innocence kills, and karma is a harsh mistress. Awesome interview. Gothic horror has been pulling me in lately. And I forgot to mention sci-fi/horror–yes! Event Horizon is another favourite of mine. Loved reading every single interview in this series. Thank you Selah. The wonderful Selah Janel interviewed me on her blog. I’m talking women, horror, and… refrigerators. 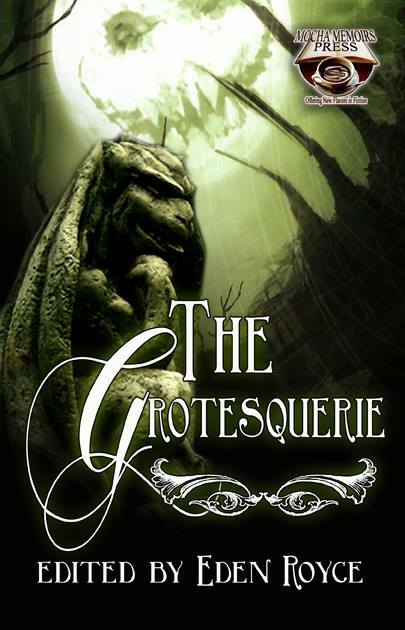 Selah, thank you for interviewing me and for putting together interviews with “The Grotesquerie” authors. It was such an amazing feeling when this project came to fruition. Never heard the phrase women in refridgerators before. Considering how geeeky I am, you would think I would know stuff like that. The images conveyed by the term are great though. Makes me want to use it at some point in a story.